Monday August 24 - 1931 I did washing and went over the rooms cleaning Soon after dinner went out to Aunt Emmas for the afternoon Wrote M E Culbertson and Blanche Black. The Byington young folks got my letters to mail. Tuesday August 25- 1931 I was busy all forenoon. 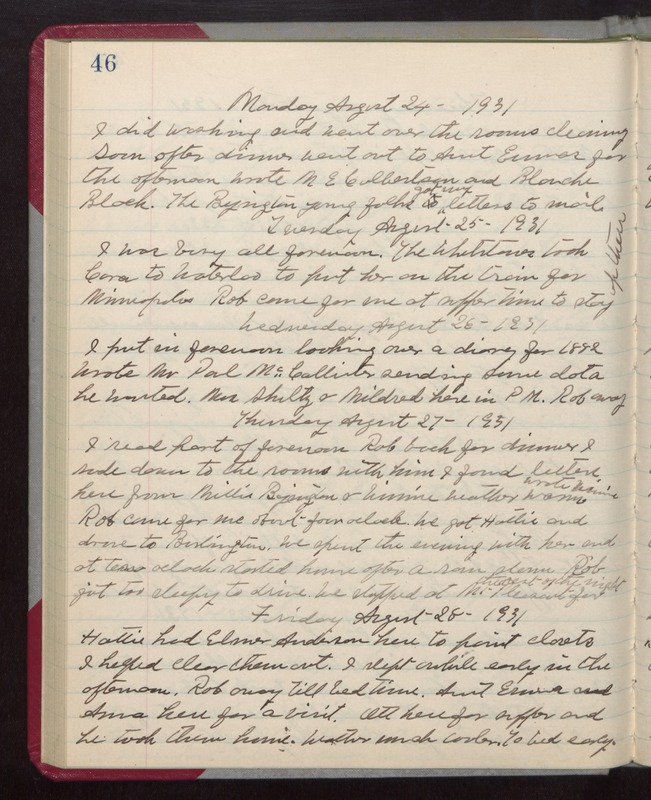 The Whetsones took Cora to Waterloo to put her on the train for Minneapolis Rob came for me at supper time to stay up there Wednesday August 26- 1931 I put in forenoon looking over a diary for 1882 Wrote Mr Paul McCallister sending some data he wanted. Mrs Shultz & Mildred here in PM. Rob away Thursday August 27- 1931 I read part of forenoon Rob back for dinner I rode down to the rooms with him I found letters here from Millie Byington & Winnie weather warm wrote Winnie Rob came for me about four oclock. We got Hattie and drove to Burlington. We spent the evening with her and at ten oclock started home after a rain storm Rob got too sleepy to drive. We stopped at Mt Pleasant for the rest of the night. Friday August 28- 1931 Hattie had Elmer Anderson here to paint closets I helped clear them out. I slept awhile early in the afternoon. Rob away till bed time. Aunt Emma and Anna here for a visit. Ott here for supper and he took them home. Weather much cooler. To bed early.